1. Rhinoceros at Cal Performances: Theatre de la Ville from Paris is visiting all the usual stops a company of its size and renown would visit on a U.S. Tour, from UCLA Live in Los Angeles to the Brooklyn Academy of Music in New York. 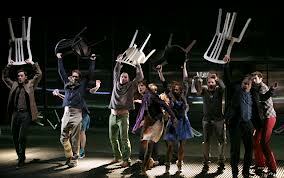 This past weekend, the company, led by director Emmanuel Demarcy-Mota came to Cal Performances in Berkeley. Zellerbach Hall is in some way a great setting for Ionesco's piece of absurdist-existentialist drama. The brutish concrete architecture, the voluminous stage that seems to swallow up the performers that stand on it, unless they happen to be part of a Wagnerian symphony orchestra and the general lack of warmth of the place all serve to make an audience feel like the world is a strange and basically hostile place. Yet I couldn't quite feel connected to Mota's production. The actors' declamatory speaking style, which often veered into shouting, reminded me of the sort of thing you'd expect to hear in a staging of Racine at the Comedie Francaise. And there were lots of cliches, such making the play's hero, Berenger (Serge Maggiani) a disheveled, everyman look, in contrast to the rest of the characters, who were more put together in physical appearance. Berenger resists becoming one of the herd in the play. But the production ultimately feels like it's part of the pack rather than something that breaks from tradition. Clearly, Mota is no Berenger. 2. Samuel Carl Adams and Gustav Mahler at San Francisco Symphony: The San Francisco Symphony premiered Drift and Providence, a new work by the twenty-something composer Carl Samuel Adams over the weekend, and Mahler's Symphony No. 5. Adams ambient soundscape of a piece sounds like it might work better during a afternoon lounge session by the W Hotel pool in Los Angeles than in a concert hall. The blurred string lines merge with the percussion (led by cowbells being rubbed against each other throughout the work) to create a deep, complex wave of sound whose components are hard to pull apart from one another. Listening to the piece underwater would probably sound the same as listening to it above ground. During the second half of the concert, Michael Tilson Thomas pulled a Mahler 5 out of the orchestra which had the opposite effect. Despite what came across as a throwaway opening from the trumpet (the famous solo didn't sound as ominous as I like it to sound) every note came out with clarity, precision and flow. Adams' work put me to sleep; Mahler's woke me up.